It has been a long while since my last update. Here’s one wedding which i enjoyed some time back. Thank you for giving me an opportunity to document your wedding. Heyo, we have gone missing for quite a while. Dixie (now my wife :)) and I had gone for our honeymoon in Veligandu, a beautiful 650m long resort in Maldives. An awesome island for anyone who likes the sun, beach and sea. A wide range of villas available for selection; water or beach gives the option of waking up facing the open sea or sunrise on the beach. Sleep with your snorkelling gears and you can jump into the sea the moment you open your eyes. For anyone who is keen to visit Maldives resort, please please opt for the All Inclusive Package (AIP). You can just forget about the word “cash”. Just drop by any of the restaurants and 24 hours bar for a free drink (cocktail, juices or alcohol), just like home. Best thing is its “24 hours” service. The international buffet provided by Veligandu Restaurant is awesome as well. With a different selection of soup every meal. Click on the image below for Pano tour and all the activity. We took a seaplane from Male International Airport to Veligandu, the holding area for seaplane flight is comfortable, unfortunately, the seaplane flight itself isn’t. Greeted by the the staff with personalised “guide” from entrance to your villa doorstep. Nope, i do not have picture of their rooms, i am there as a tourist, you may check out their website for their villas and suites. The sea is so clear that occasionally sharks, manta ray and dolphins drop by to say hello. Otherwise, we will just roam around the island taking pictures of ermm, ourselves. But considering the island is only that big we always end up in the same place. Dinner ends pretty late, and by the time we are done, its pretty late and we have to walk some distance back with the help of little lights + moonlight which i find night time to be a little eerie. The sea comes to live and there are lots of activity down there, if you decide to spend some time searching. Otherwise, the big bird might drop us a visit + poo, if you are lucky enough. Thank you all for the support in Facebook! To start off, enjoy additional $200 off our Videography friends Packages! Erictangallery will be collaborating with our videography friends for 2015-2016 Actual Day (AD) Wedding packages. 2. our beloved Videography friends’ (as below) AD Wedding Videography Packages. Feel free to contact us at info@erictangallery.com to find out more. 1. 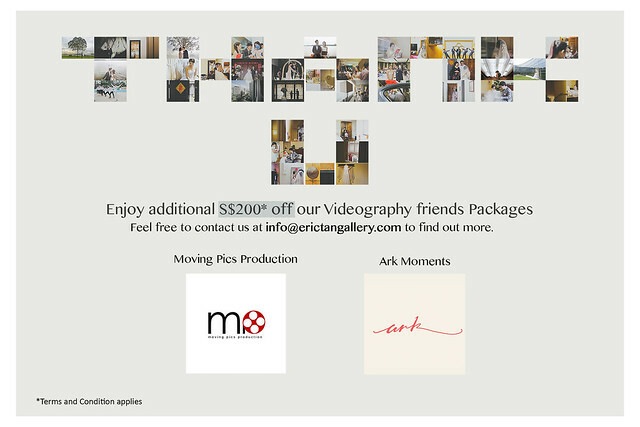 Couple has to sign up Ark Moments or Moving Pics Production Actual Day videography wedding packages and erictangallery actual day photography packages to be eligible for the additional S$200.00 videography package off. 2. Bundle is for single couple only. Not for sharing. 3. Subjected to photographers or videographers availability. 4. Couples whom have signed up for videography packages with our videography friend can still be eligible to apply, simply show us the videography contract to claim your S$200.00 off.